I'm not sure what's going on or how it's gotten to this state, but whenever I go to the Tab Manager settings and just hit "OK", the Windows Home Server Console crashes on me. Whoop. I was about to leave more details when I figured out what happened: if you uninstall an Add-In while it's put in the Tab Manager, it doesn't remove the HomeServerConsoleTab.TabManager.<>.dll. Understandably. 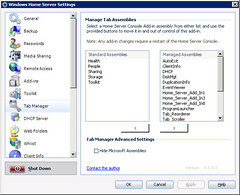 But Tab Manager still thinks it's installed, so when trying to manipulate the .dll, it crashes the Home Server Console. What add-in did you uninstall while it was being handled by Tab Manager? My best guess would be that that add-in was depending on something that was removed... even though the main assembly still exists. a) Install WHS Disk Management and Tab Manager. 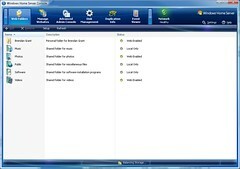 b) Move WHS Disk Management to be in a tab. c) Uninstall WHS Disk Management. 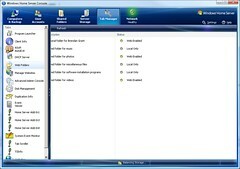 d) Manipulate Tab Manager in Settings. I have tried to move an add-in back to being unmanaged, and the console closed itself every time without the add-in being changed. I am not sure if it was coincidence, but it too was Disk Management. In the end, I renamed the dll so that I could uninstall and reinstall a new version. I also left a comment over on the We Got Served site. I feel it would benefit having the add-in list on the right rather than the left. Even with it minimised, it encroaches a little into the Add-In area, but most (I tried about 10) don't have much over on the right hand side. not sure why this is happening but here is what happens, i go to uninstall the tab manager and the console crashes on me.. I am in the same boat as the other Anonymous person. Maybe I didn't read the instructions well enough for setting it up. So I have uninstalled it and only get the health monitor. When I click on settings I get a large error page mentioning access denied and security violation. This stops me from getting to any of the settings to modify anything. Now for the obviuos cry for help, "HEEEEELLLPPPP!!!!. I did it by selecting all of them and nothing worked and they where all back to being under tab manager control, so you have to do them one at a time, i know its a pain but thats how i did it and got my tabs back to the normal server settings, once you have removed all of them then uninstall the program and re log back in and they will be there like they where befor the tab managaer was installed. I am in the same boat as the previous two posters. But even after reinstalling the Tab Manager I cannot move things from managed to standard even one at a time. At this point I have lost most of the Icons in the console top bar. ok. I installed tab manager. then i lost all my add ins. i uninstalled tab manager and i still have no add ins. i'm lost. Advanced admin console does not like the Tab manager. I am stuck without being able to get to the Homeserver console right now. I am not sure what to do next. Is there a way to start the console without the add-ins loading. I was trying to unmanage the add-in (Advanced admin) but it was refusing to go. Tab Manager has, many, many bugs. Too many to list here. Thought one seems particularly egregious: this addin uses another unauthorized piece of s/w, "Janas" I think it was called (flew by too fast to read clearly). I got this error error message 5 times when the addin fired up the first time when I clicked on the left column tab for Tab Manager in the setting screen. I should have bailed then, but I sadly didn't. When trying to move tabs via the tool I got duplicates, even triplicates of individual tabs. Then it only got worse when I tried to move the tabs back. As a final stroke, I uninstalled Tab Manager and now my client connector session crashes when I try to get in (sometimes the window window opens where the WHS host is supposed to be is completely blue as in the friggin' "blue screen of death"). Despite all standard approaches and hacks, I can not get back into WHS via my client side on either of two home office systems. I've hooked up my keyboard, mouse and monitor again to my WHS server (1st time since my original install) but I can not even reinstall WHS from CD successfully. The error message is that I don't have permission to access certain files and/or sub directories… even though I'm the system administrator. Can anyone tell me where to find the dll to rename it? I've searched the server with remote but can't find the file. I have two avast icons showing and disk management. I've uninstalled/reinstalled tab manager and that doesn't help. Whenever I try to remove those two icons the server crashes.